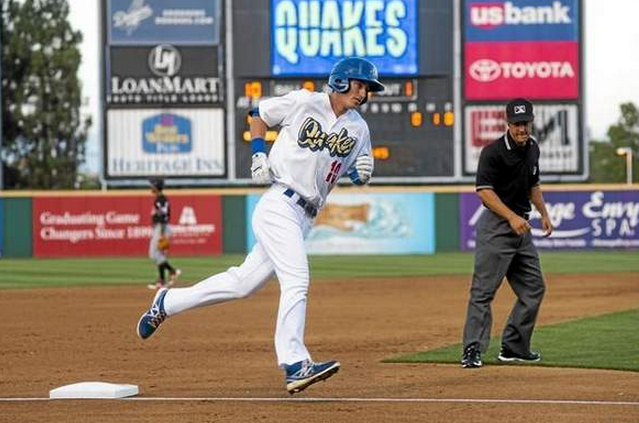 The Quakes’ Cody Bellinger rounds the bases on Aug. 3. The 2015 California League post-season all-star team was announced on Friday, and both the Quakes and 66ers were represented on the team. The Quakes’ Tyler Ogle was named the catcher on the squad. Through Thursday, he was batting just .255, but belted 19 home runs and 64 RBIs in 94 games. He was especially effective against right-handers, batting .342 with seven home runs in 79 at-bats. Cody Bellinger, primarily a first baseman for the Quakes, was named the designated hitter on the squad. Like Ogle, Bellinger’s batting average is not high: .256. But also like Ogle, he’s had success with the long ball, hitting 26 home runs and driving in 87 runs in 114 games. He hasn’t played since last Saturday after taking a pitch off his hand. The 66ers’ Eric Aquilera, who has played mostly first base, but also some left and right field for the team, was named the utility player on the squad. Aguilera is batting .333 with 16 home runs and 90 RBIs while stealing 13 bases in 113 games.